Along with doing public ski reviews I occasionally get to ride R&D skis and give feedback to the factories. These reviews are confidential until it no longer matters. Last August I took one ride in a 66” H2 Prototype. The ski is no longer a secret so I guess I can talk about it. Caveat => We all know first impressions of skis are notoriously inaccurate & test skis are often not exactly the same as the production skis. So what did I think if it? After I rode the H2 I left Will Bush a voice mail that said that the ski I rode was at least as good as any ski I have ever ridden. That test ski was the wrong size for me and had someone else’s settings but I still almost reached my PB on my first ride. I was extremely impressed with that ski. I am very optimistic that the H2 is going to be HUGE. I expect to unbox an H2 soonish and then start a review as soon as the weather and my skiing becomes more consistent. Always loved D3 and KD. H2 on my short list if I make a move this season...after seeing how my spine holds up through spring. Will try my bro's Mapple with my binder's, too (if he will let me!). If not, will steal it under cover of darkness, get my ride and have it back by morning. Still love my Helix which I have set my practice PB on, will be interesting to see how new vs old because the current Helix is so good. 2014 was my first season on a D3, and the Helix did not disappoint. 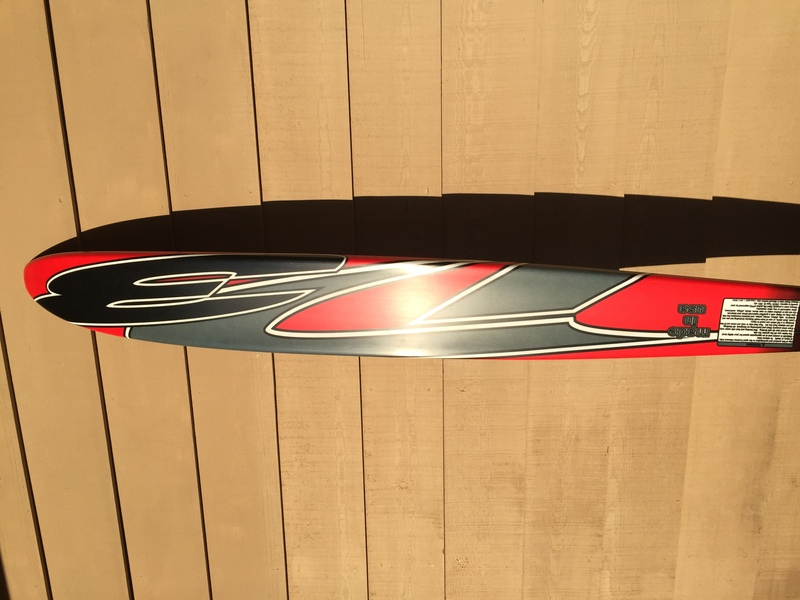 Its been my favorite ski since I first rode an A1. I liked but wasn't in love with the Helix last year. The ski felt good but I was just never able to run the buoy count I expected too. Of course my body was a bit of a mess also. I will be interested to try the H2. And to think I just dropped a ton of cash on a Helix... I wonder if the H2 is worth selling the old one and buying? @Horton - Have you ridden the first version of the Helix yet? @ozski I never rode the original ski. And to think I just dropped a ton of cash on a Helix back in July... I wonder if the H2 is worth selling the old one and buying? Depending on weather I should unbox and ride the H2 Saturday. I few spy photos of a H2. Oooh, does this mean the fluorescent ski trend is finally dying down? Nice to see that the bottom graphics from my 2013 Quest are still the in thing as well. I have to say that charcoal metal flake looks good. 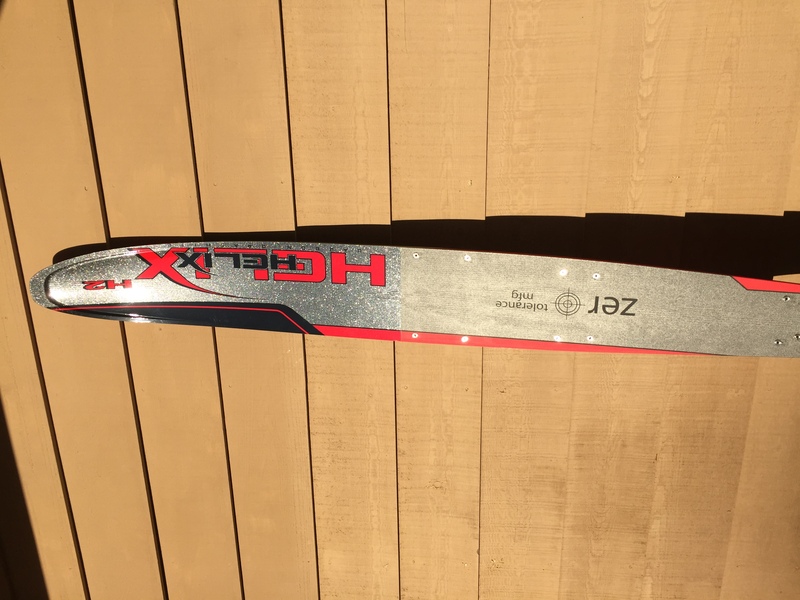 @Horton are you going to ride a 66 or 67" ski. You usually ski on 67s don't you? 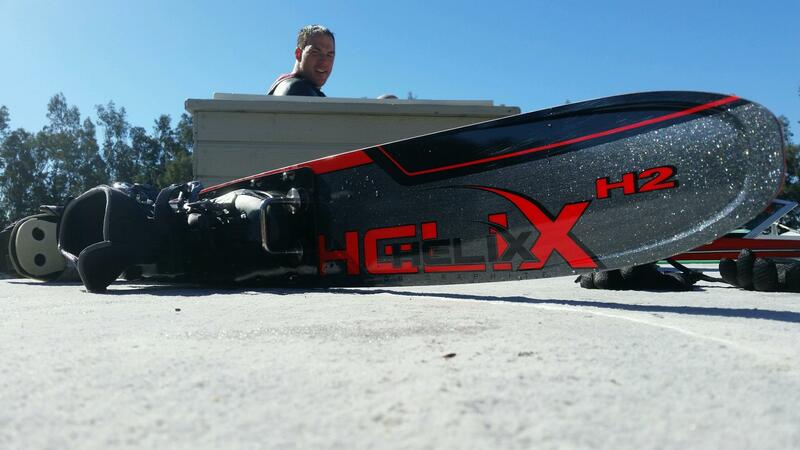 @bishop8950 Horton loves when you keep his ski! Was that you skiing yesterday with Will? Let me ride that ski before Horton. It will make him really happy. @bishop8950 black helicopters circling as you ski. Conspiracy? @Horton, Crawford assumed the helicopter was circling per your command, to protect your inbound skis. The timing was freaky actually. We were just joking around about @Dirt and stolen skis and there he was hovering over the lake minutes later. I ran six 32s in the wind on the H2 today. It is hard to tell much in the cold and the wind but I think it is going to be pretty darn good. I seems to carry a lot of speed back to the inside and carve a noticeably smooth arc on off side. I am not going to start a real review for a few weeks but I will take a few rides before then and let you guys know how it goes. Ok it is not SUPER cold but not warn enough to ski at 100% of my level. @Horton is it really the "cold" or is that winter IPA weight holding you back?